The wildfires that ravaged the High Plains might be put out but the damage will continue to inflict financial pain for years to come. Fundraising efforts by local livestock auctions and bull sales are already underway to aid producers in Kansas, Texas, Oklahoma and Colorado. 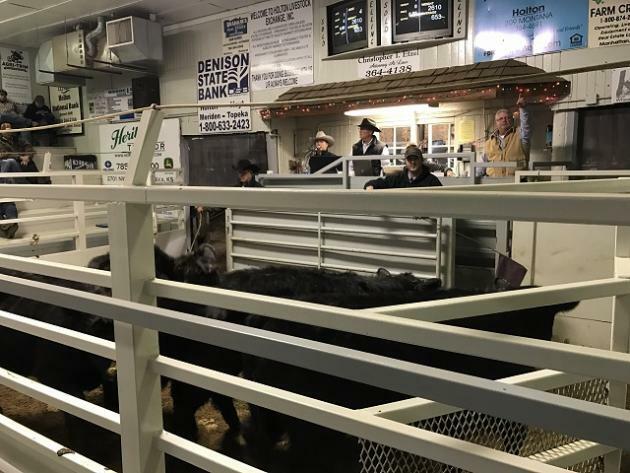 At Monday’s feeder sale at the Joplin Regional Stockyards (JRS) in Missouri a calf was sold over and over, raising approximately $28,000 for fire relief efforts. “It was a huge success,” says Mark Harmon, JRS marketing director. The funds were raised in about 20 minutes during the middle of the feeder sale. “There are a lot more important things in life than what your cattle bring when people need help,” Harmon adds. The calf donated by JRS owner Jackie Moore was bid on by people directly at the weekly sale like order buyers, local farmers, salebarn employees and even people who couldn’t make it by leaving donation bids over the phone. Harmon says donations are still being accepted at the stockyards and there will probably be another fundraising auction at an upcoming cow sale. Proceeds from the sale are being split between the Oklahoma Cattlemen’s Association Foundation Fire Relief Fund and Kansas Livestock Association Foundation Disaster Relief. A similar rollover auction was hosted at Decatur Livestock Market in Texas raised $57,201.50 on Monday. To start the fundraising effort there were 75 items like baked goods, vacations, a shotgun, a cowboy hat and various farm supplies offered up for auction prior to several calves being sold with a roll over option. An estimated 100 people put in bids, according to Decatur Livestock Market co-owner Kimberly Irwin. Funds raised from Decatur are being divided between three donation locations in the Texas Panhandle to help cover the areas hit by the fire. There are still at least 10 more donation auctions planned by Livestock Marketing Association (LMA) members in seven different states. LMA-member market, Emporia Livestock Sales, will be hosting a rollover calf auction to benefit those affected by the wildfires. The steer will be donated by Arndt Farms of Emporia, KS. LMA-member market, OKC West Livestock Market LLC, will be hosting a rollover calf auction on March 15 to benefit victims of the wildfires in Oklahoma. The auction will begin at noon. Give them a call if you cannot attend but would like to donate. Proceeds will go to the relief fund established by the Oklahoma Cattlemen’s Foundation. LMA-member market, Sterling Livestock Commission Co., will host a charity rollover calf auction to benefit wildfire relief efforts in Colorado. The auction will be March 15 at 12:30 p.m. Proceeds will go into a special account which will be used to purchase fence supplies at distributor’s cost. For more information, contact Sterling Livestock at 970-522-1950. LMA-member market, Wichita Livestock Sales Co., has set up an account to donate to the fire victims. Items donated will be auctioned off Wednesday, March 15 at 12:00 p.m. For more information, contact Billy at 940-733-9866, Lynn at 940-733-9856 or Marianne at 940-733-9566. LMA-member market, Woodward Livestock Auction, will auction off at least 3 head of cattle at noon Thursday, March 16. Proceeds will benefit farmers/ranchers affected by the Oklahoma wildfires. LMA-member market, Dunlap Livestock Auction, will host a rollover calf auction Friday, March 17 beginning at 12:00 p.m.
LMA-member market, Livestock Exchange, in Brush, Colo., will host a rollover calf auction on Friday, March 17 beginning at 1:30 p.m. The calf will be donated by Tyler Knode. LMA-member market, Montgomery Stockyards, will host a rollover calf auction Monday, March 20, to benefit farmers and ranchers affected by the wildfires in Kansas, Oklahoma, Colorado and Texas. LMA-member market, Imperial Livestock Auction, will host a rollover calf auction to benefit those affected by wildfires. LMA-member market, Pratt Livestock, will have a benefit auction to raise money for those affected by the wildfire in Clark and Comanche counties. The auction will be on March 23 at 12:00 p.m. and proceeds will go to the Kansas Livestock Foundation. LMA member-market, Cherokee Sales Co., in Cherokee, Okla., will host a rollover calf auction for wildfire relief. Kripple E Cattle Co., owned by Kyle and Kelsy Eastwood, donated a heifer to auction off, and the heifer will sell on Wednesday, March 29 at 11 a.m. Proceeds will go to the relief fund established by the Oklahoma Cattlemen’s Foundation. LMA member-market, Beatrice 77 Livestock Sales, will host a rollover calf auction on April 1. A cow-calf pair will be sold in the rollover calf auction. LMA-member market, Oklahoma National Stockyards Company, will collect donations for the next two weeks during the auctions. Donations can be made at the credit desk to benefit victims of the wildfires in Oklahoma. The proceeds will be put in the Oklahoma Cattlemen’s Foundation wildfire relief fund to be distributed. LMA-member market, Floydada Livestock Sales, is partnering with Floydada FFA to collect donations (fencing supplies and feed or monetary donations to be used for those things) to benefit farmers/ranchers affected by wildfires in Texas. Donations will be collected until March 24, 2017. If you’d like to donate, contact the market at 806-983-2153. LMA-member market, Blue Grass Stockyards, will be collecting monetary donations through Saturday, March 18. Contact information can be found at www.bgstockyards.com/contact-us. Last year similar cattle sale were held after the Anderson Creek Fire and efforts at Pratt Livestock helped bring in $92,935 when a heifer was sold 76 times. Woodbury Farms near Quenemo, March 15, will donate a registered Angus heifer for sale during their annual bull and female sale at Overbrook Livestock Commission Company. The heifer will sell as lot 55. To view the sale catalog, go to www.woodburyfarmskansas.com. Flat Iron Angus of Haddam, March 15, will be donating the proceeds from the sale of an open registered heifer at their annual production. Their sale catalog is posted on www.flatironangus.com/. Springhill Herefords and Alcove Cattle Company, both of Blue Rapids, Mach 18, will contribute 5% of all bull sales from their On Target Bull sale. Customers can match the 5% or donate more, if they so choose. The sale catalog can be viewed at www.springhillherefords.com/. Hinkson Angus Ranch of Cottonwood Falls, March 21, will donate the proceeds from a 3-year-old commercial cow-calf pair to sell during their annual production sale. The pair will sell as Lot 130. To view the sale catalog, visit www.hinksonangus.com. McCabe Genetics of Elk City, March 23, will be donating 25% of the proceeds of two bulls selling in their annual bull and commercial female sale. The bulls well sell as Lot 1 and Lot 192. Both bulls can be viewed on videos at www.mccabegenetics.com/.